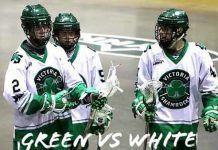 June 1, 2013, Victoria, BC (ISN) – The Langley Thunder came into Bear Mountain Arena Friday to face the Shamrocks in a battle of the undefeated – to the victors went first place – and in a tight, low-scoring but intense game it was the home Shamrocks coming away with an 8-7 victory. Matt Flindell got the start in goal for Victoria with big Brodie McDonald his counterpart at the other end of the floor. The home team got on the board first, Scott Ranger putting home a shot off a transition break-out at 4:09. Langley replied with a pair, Scott Johnson converting at 12:43 also on a break-out and Shayne Jackson connecting from the corner of the crease at 14:17. Before the period ended, Jeff Shattler tied things at 2 when he made a swim move around the defender to put the ball in the back of the net at 16:02. That goal was scored shorthanded. The period was played very quickly with lots of end-to-end action but not a lot of sharpness. Shots on goal were 15-9 in favour of the Shamrocks and each team took just 2 minor penalties. Victoria took the lead 7:36 into the middle frame, Corey Small going to the net to beat McDonald. Langley came back a little over 3 minutes later, Joel McCready managing to score despite being hammered to the ground in front of the crease. The Rocks got some momentum going when they scored the next 3 goals, the first coming just 6 seconds after the tying Langley marker, Tyler Burton grabbing a pass from Nolan Heavenor t 11:05. At 14:56 Rhys Duch scored in his first game since returning to the Shamrocks and at 15:56, Ranger picked up his second of the game off a rebound right in front. Once again the visitors battled back as goals from Tor Reinholdt at 16:14 and another from Alex Turner, on the power play at 18:03 got them back within a goal. Ranger managed his hat trick marker at 19:10, a hard shot that snuck through at 19:10 to make it 7-5 for Victoria after 40 minutes. The period was marked by a lot of missed passes, and generally sloppy play by both sides. There were a few more penalties but still nothing getting out of hand; clearly these teams don’t like each other a lot. Langley battled back in period 3, Shayne Jackson scoring at 4:30 again off a transition break-out as he passed in front of the net and fired back. Johnson picked up his second for the visitors at 15:13 and suddenly the game was tied and the possibility of overtime looming. 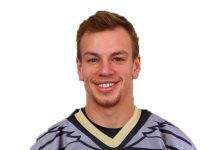 But it was Cory Conway to the rescue for the Shamrocks as he squeezed a shot just inside the post at 17:17 and Flindell shut the gates on a couple of late attempts by the Thunder. 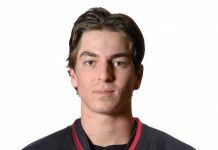 Shots on goal finished 38-37 in favour of Langley and the goaltenders Matt Flindell and Brodie MacDonald were named first and second stars respectively with Nolan Heavenor named third star on the basis of his faceoff record and 2 assists. 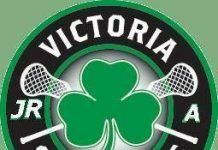 The Shamrocks are on the road Sunday to face the Maple Ridge Burrards and will face Nanaimo and Burnaby on the road before returning to Bear Mountain Arena June 14 when Maple Ridge will be the visitors.